OK, so it's not strictly speaking a room but your garage design has a lot more potential than you think. Yes, really - it does. Let's get this discussion underway by thinking of what your garage might be used for. What happens in your garage? So these are the activities that come to mind when I'm thinking of the car closet. There might be a few you hadn't thought of that will inspire you to do a little more with your garage. Parking your car or cars. It strikes me that if you live in a slightly warmer climate there are more possibilities for using the garage for living activities as well as parking the car. 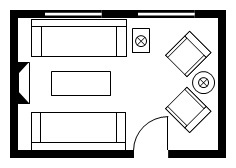 These garage design pages form part of the design a room series. Keep the following in mind when you're working through your garage plans. The garage space needs to meet parking needs and be in proportion to the house and lot. Sometimes this is a bit of a balancing act. You don't want your home to be dominated by the garage. Think of the curb appeal of your house and make sure the garage isn't using the prime space on the lot that has a view or gets lovely sun. Do you need to be able to park all the household cars in a garage? The location of your parking space needs to make sense with you way you intend to use it. If you intend to come and go through your garage everyday it makes sense to connect the garage to the house if possible, or locate it close to the house. This means that you can get from the car to your home without getting wet (or too wet) if it's raining. Don't forget to think about the entry space within your home at the garage entry point. You might find the page on foyer design useful here. We have one car and two garages but we ride bikes most of the time so the garage which has an entry into the house is used to store the bikes and the other garage is used for storage. The car gets left outside. 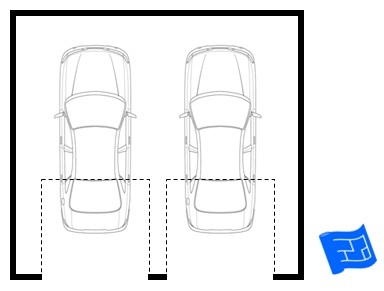 The garage needs to have sufficient space to park and open the doors to the car and walk around the car. Who wants to have to visit the body shop because the car door smashed int the garage wall? Depending on where you live, think about what side the driver gets out. It makes sense to have the drivers door near the entry into the house if possible. If your garage has a wall facing onto your yard or garden it makes sense to include a door out to the garden from the garage. Include some natural light if possible using windows in the walls or higher level transom windows. Skylights might also be an option, or including a window in your garage doors. Allowing some light through the door that connects the house to the garage (if the garage is attached) is also an option. Specify a flooring finish that will be appropriate for what you expect that your garage will be used for. eg If the idea is that the garage will be used as a teenage hang out it might be worth going that extra mile and polishing up the concrete. Don't forget to include all the utility (eg water tap), electrical (eg fan) and other wiring (eg internet) requirements in your garage design plans. Here are one or two mistakes that I've seen. Finding that once an electric door is installed the camper van won't fit into the garage. If your garage has steps down into it, make sure that the door doesn't open onto the stairs as this is a safety risk. Moving in to find that the car won't fit into the garage. Cars have got bigger over the years so if you're buying an older home, it's worth just measuring that garage to be aware what size it is. If you're planning to make the most of your garage space, which of these will you find useful in your garage design? Don't forget to include them on your plans. Make sure you've got enough plug points and that there's a separate garage circuit. Garage heater. Plan in a power socket for a heater. It needn't be a floor heater though, how about hanging it from the ceiling? Wireless reach or internet socket. Automatic doors - don't forget to wire in power for the motor. They are generally cheaper to build than a garage. They can still incorporate secure storage with individually locked storage units along a wall. Sometimes they can be erected without planning approval because they're open. Some of the ideas discussed on this page and on the other garage pages are illustrated in glorious technicolor in the images below. I've written some comments to go along with each one.